Emory professors Natasha Trethewey and Kevin Young are among 10 celebrated poets commissioned by New York's Museum of Modern Art (MoMA) to write poems inspired by the centennial of the Great Migration, the decades-long mass movement of African Americans from the rural South to the urban North that started around 1915. The poetry suite, available online, is part of MoMA's current exhibit "One-Way Ticket: Jacob Lawrence's Migration Series and Other Visions of the Great Movement North," which runs through Sept. 7 and also includes materials on loan from Emory's Manuscript, Archives and Rare Book Library (MARBL). At only 23 years old, Jacob Lawrence created a series of 60 small tempera paintings with captions about the Great Migration. Lawrence's work, completed in 1941, is considered a landmark in the history of modern art and an important example of how history painting was radically reimagined in the modern era. "Personal and collective history feed into poetry," writes poet and essayist Elizabeth Alexander, who selected the poets for MoMA. "Art begets art and influence crosses art forms. We have here new American poems, another indelible piece of this American epic that continues to live and reveal itself." In addition to Trethewey and Young, poets include Rita Dove, Nikky Finney, Terrance Hayes, Tyehimba Jess, Yusef Komunyakaa, Patricia Spears Jones, Lyrae Van Clief-Stefanon and Crystal Williams. They will present debut readings of their poems Friday, May 1, during an event at MoMA that will be streamed live beginning at 6:30 p.m. on YouTube. Trethewey is Robert W. Woodruff Professor of English and Creative Writing at Emory. She won the Pulitzer Prize for poetry in 2007 and was United States Poet Laureate from 2012 to 2014. Her contribution to the exhibit, "As the Crow Flies," shows in shattering brevity how families were divided by the Great Migration. Young is Atticus Haygood Professor of English and Creative Writing at Emory, where he is also curator of literary collections at the Raymond Danowski Poetry Library. His contribution, "Thataway," explores the stark reasons that African Americans felt they had to leave the South. "When writing my poem, I found myself especially drawn to Lawrence's panels on reasons for African Americans leaving the South, including lynching, and that entered the poem," Young says. "The refrain too — 'I got there early,' meaning to the train station — I hope conveys some of the urgency but also practicality of the folks who headed north. That some of this urgency and violence appears in the news now only heightens the prophetic power of Lawrence's work." 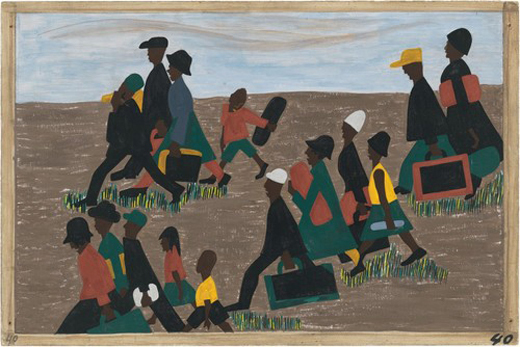 Shortly after Lawrence completed his Great Migration paintings, the series entered the collections of the Museum of Modern Art and the Phillips Memorial Gallery (now The Phillips Collection). Each institution obtained half of the panels, and the current exhibit unites the entire series at MoMA for the first time in 20 years. "I've known of Jacob Lawrence's Great Migration series for years, and the chance to see all the work in one place really inspired me — curator Leah Dickerman and MoMA have done an outstanding job not just mounting the series but providing the full context," Young says. Along with Lawrence's series, the exhibition includes other accounts of the Great Migration from the era, including novels and poems by writers such as Langston Hughes, Claude McKay and Richard Wright; music by Josh White, Duke Ellington and Billie Holiday; photographs by Dorothea Lange, Ben Shahn, Gordon Parks and Robert McNeill; sociological tracts by Carter Woodson, Charles Johnson, Emmett Scott and Walter White; and paintings by Charles Alston, Romare Bearden and Charles White. Materials from MARBL that are part of the exhibit include books by James Weldon Johnson, Jean Toomer, Sterling Brown, Langston Hughes, Countee Cullen and Carter G. Woodson, as well as lithographs by Aaron Douglas. "It is important to have our materials available to researchers and students, as well as develop collaborative opportunities to share our resources with organizations and institutions that share similar interests," notes Pellom McDaniels III, curator of African American collections for MARBL and assistant professor of African American Studies at Emory. An in-depth multimedia website hosted by MoMA presents a detailed look at the exhibit, presenting all 60 panels by Lawrence along with artistic commentary, historical context, songs, poems, photographs and more.